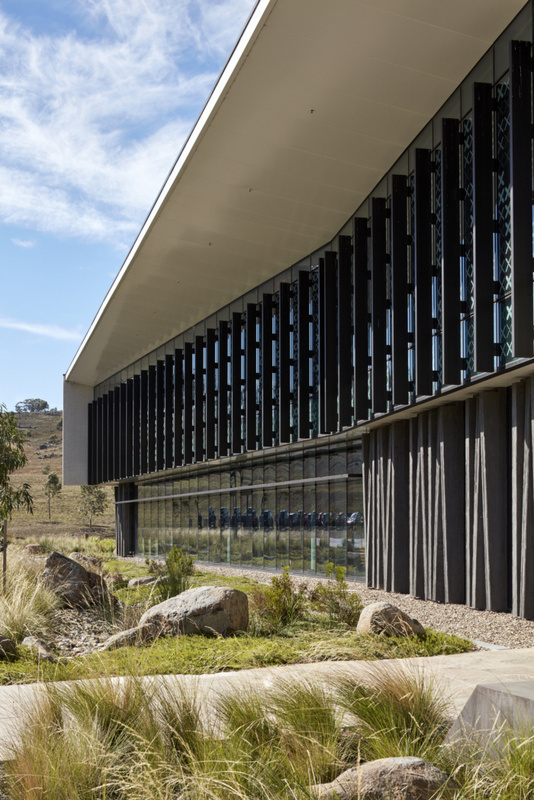 HASSELL were tasked with the design for the Australian Federal Police Forensics and Data Center located in Majura, Australia. Australian Federal Police (AFP) new Forensics and Data Center at Majura rejects the old, compartmentalised ways of working. The development of the new facilities presented an opportunity to shape the future of the AFP. Early engagement with over 18 departments allowed the resolution of the complex people, culture and core forensic capability needed. The new facility is centred on a central common atrium space, and provides strong internal, external connections through deep courtyards carved through to the buildings core. This openness and connectedness has helped facilitate better, more collaborative ways of working between people and departments of the AFP. The building incorporates a clear entry and exit, clearly defines the ‘search precinct’, offers transitional spaces for interaction between examination rooms and office space, while ensuring seamless movement throughout the building with the integration of the AFP’s security requirements. HASSELL led the briefing process, workshopping and engaging with over 18 departments to ensure the aspirational brief and organisation’s collaborative objectives were realised. The facility includes front of house conference facilities and teaching lab, open workplace and shared interaction areas and an exhibit management precinct. The laboratories accommodate biological criminalistics, chemical criminalistics, document sciences, fingerprints and ballistics. Specialist facilities include forensic examination rooms, firearms and ballistics collections, forensic firing range, audio laboratories and vehicle examination areas. Shared support facilities include central stores, shared workshops, loading dock, vehicle accommodation and deployment areas to support local, national and international field deployments. Designed to achieve 4.5 NABERS Stars, incorporate Green Star tools (although no formal accreditation was sought) the building actively responds to its environment. Solar orientation and the incorporation of landscaped courtyards allows natural light to penetrate the building. Coupled with highly efficient lighting and control systems, the building provides ample connection to the natural environment. The design is thermally efficient reducing heat gain and loss. It responds to the local climate, utilising efficient HVAC plant and equipment, and low VOC materials and finishes. The environmental monitoring system enables the ongoing measuring of the building performance.